A day of shock and surprises on our first day in Finland. The day started with a visit to Hursti food distribution centre in Kallio district, Helsinki. It was a shock to see such a line of people queuing in the street to obtain food. It was hard to think of the right to live in dignity with such a sight. The organisers said they give out food twice a week and clothes once a week. About 2500 pass through the que each time. He also said that the numbers are growing and that the relative decrease in value of the social assistance scheme is the main reason for the growth in the que. We then visited a drop-in centre for people who might need food or some company or advice in the same area. 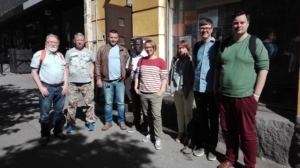 This Vailla Vakinaista asuntoa NGO is a member of FEANTSA and they were able to tell us about their work and the relatively successful use of the ‘housing first’ approach in Finland. 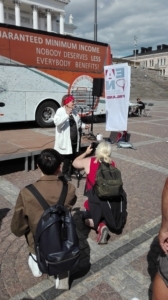 Our main #eminbus event was activities at the bus parked in the impressive Senator Square. Here a host of surprises awaited us, not least our guest artist ‘rap granny’ an 82-year-old rap artist (Rap-Mummo Eila) who performs text she wrote about the experience of growing old, texts against racism and discrimination and about other social issues she sees in Helsinki. There was a whole host of entertainers and musicians including a comedian who performed stand up about the experience of labour market activation measures. A men’s group ‘step millionaires’ who encouraged and supported exercise and walking particularly for older men. Musicians Mikko Perkoila and Mikko Joensuu also performed and are well worth checking out on YouTube. 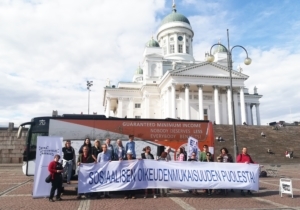 Political engagement was also very present, with inputs from Sanna Vesikansa, Deputy Mayor, Paula Lehtomaki, State Secretary to the Prime Minister, Outi Alanko-Kahiluoto, from the Poverty Group in the Parliament and Pekka Ristelä form the Central Organisations of Finish Trade Unions. Jiri Sironen, chairman of EAPN-Fin, pointed out that there are some big contradictions in Finnish social policy around minimum income. The governmental report about the 2030 Agenda states that ”In reducing inequality and poverty, ensuring sufficient basic income and equal welfare and employment services is important.”, but still there have been cuts of benefits. The government also launched the basic income experiment with international attention, but then in last year rushed to implement the ”Active model” without testing. The Active model cuts unemployment benefits if the receiver is not active in certain way, and has already cut benefits for half of the unemployed people. Now Finland is planning the overhauling of social security benefits. The overhauling should both tackle inequality and reduce the sustainability gap in public finances. In EMIN we believe enabling schemes are essential, however, I begin to fear that ‘activation approaches’ take away the right of initiative from the people who need the assistance and creates a situation where those ‘who know better’ decide what would be activating for the people concerned. It often also results in a transfer of investment to the so called ‘active measures’ and decreased investment in the so called ‘passive measure’ (giving cash to people). The result is that people have less money and less space to use their creativity and insights. In the end, they are made more passive by being ‘advised’ what is best for them, rather than working from their own capabilities. I hope Finland can avoid this approach to activation.